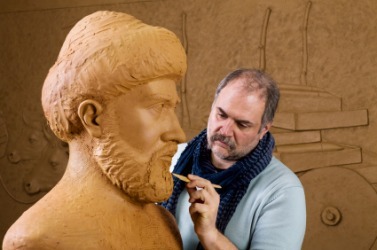 A sculptor creates a bust with clay. The definition of a sculptor is an artist who takes a material and molds or carves it to make a finished product. An artist who takes a lump of marble and carves it into a statute is an example of a sculptor. "sculptor." YourDictionary, n.d. Web. 13 April 2019. <https://www.yourdictionary.com/Sculptor>. One who produces sculptural artwork. One who shapes, molds, or fashions especially with artistry or precision. Sculptor A constellation in the Southern Hemisphere near Cetus and Phoenix. Also called Sculptor's Workshop . Latin from sculpere to carve ; see sculpture . A person who sculpts. An artist who produces sculpture. (astronomy) A dim spring constellation of the southern sky. It lies between Aquarius and Phoenix and lies in the direction of the southern pole of the Milky Way. Named by the French astronomer Nicolas Louis de Lacaille in 1763. Originally called ApparÄtus ScÅ«lptoris, Latin for "sculptor's apparatus" but later shortened. The museum also contains drawings and letters of the sculptor Antonio Canova. It was the birthplace of the sculptor and painter, Gaspar Becarra. In Paris he was arrested on the suit of a sculptor, whose statue had been injured in the New York World's Fair (of which he had been a director), and spent two days in Clichy, of which he gave an amusing account. Using the hammer only, some of them can beat out an intricate shape as truly and delicately as a sculptor could carve it with his chisels.